Elie Wiesel, OB”M Holocaust survivor, Nobel Peace Prize laureate, prolific author and outspoken activist Elie Wiesel passed away Shabbos, at the age of 87. Wiesel was perhaps best known for his major role in promoting Holocaust education, and for perpetuating the memory of the Holocaust in the post-World War II era with his memoir “Night,” based on his experience as a teenager in the Auschwitz concentration camp. Eliezer “Elie” Wiesel was born on September 30, 1928 in the Romanian town of Sighet, to Sarah and Shlomo Wiesel. His maternal grandfather, Dodye Feig, was a member of the Vishnitz Hasidic sect; his strong influence over Wiesel was seen later in some of his writings. Wiesel received a traditional religious education while growing up in Sighet; many years later, in 2002, he returned to his hometown to dedicate the Elie Weisel Memorial House at the site of his childhood home. The Wiesel family’s lives were seriously disrupted in 1940, when Hungary annexed Sighet and all the Jews in town were forced to move into one of two ghettoes. In May 1944, the Nazis, with Hungary’s agreement, deported the Jewish community of Sighet to the Auschwitz-Birkenau concentration camp. The teenage Wiesel was sent with his father Shlomo to the Buna Werke labor camp, a sub-camp of Auschwitz III-Monowitz, where they were forced to work for eight months before being transferred to a series of other concentration camps near the war’s end. In his book of memoirs “All the Rivers Run to the Sea,” Noble Prize Laurite and Holocaust survivor Elie Wiesel tells the following episode. 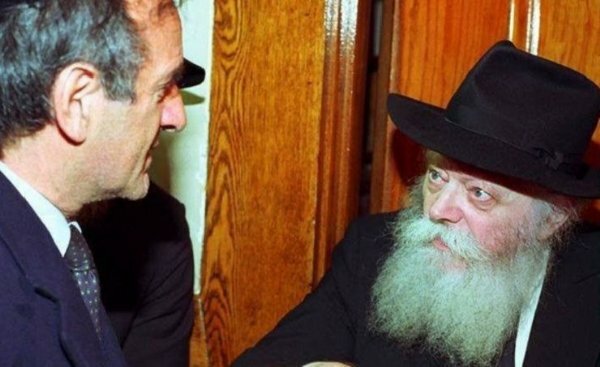 At my first visit to the the Lubavitcher Rebbe’s court [at 770 Eastern Parkway, in Brooklyn, NY]… I had informed him at the outset that I was a Chasid of Vishnitz, not Lubavitch, and that I had no intention of switching allegiance. One year, writes Wiesel, during Simchas Torah, I visited Lubavitch, as was my custom. “Then do as we do in Lubavitch,” he said. He handed me a glass filled to the brim with vodka. “Nor in Lubavitch,” the Rebbe replied. He emptied his glass in one gulp. I followed suit. “Is one enough in Vishnitz?” the Rebbe asked. He handed me a second glass and refilled his own. He said L’chaim, I replied L’chaim, and we emptied our glasses. I wasn’t sure what to say. And the Rebbe blessed Eli Wiesel to begin his life anew. The man who was still tormented by the horrors of “Night” (the name of his first book), where he saw the most horrific sights the human eye could endure, the individual who refused to marry and have children feeling that it is unfair to bring Jewish children into such a cruel and brutal world, ultimately rebuilt his life from the ashes, creating a family, and becoming a spokesman for hope and conscience the world over. On the day of his son’s bris, he writes, friends sent gifts. “But the most moving gift came from an unexpected place.” It was a beautiful buckeye of flowers sent from the Lubavitcher Rebbe. I guess it represented his blessings for a life invigorated with a fresh start, blossoming like a beautiful, fresh flower. He named his son, Elisha, after his father who perished in Buchenwald. As Eli Weisel once reminded me, this was just a few weeks before my own bris, which Weisel attended, as my late father attended his son’s bris. My father and Eli worked closely together for many years as Jewish journalists. A survivor of Hitler and a survivor of Stalin—like so many other survivors of unspeakable horrors—chose to take out a new license on life, love and happiness.